Two hundred miles south of the Devon coastline, Palestinian freedom fighter Abed Abu Omar and twenty men prepare for a daring mission they have trained more than a year for - the hijack of a super tanker, a five-storey superstructure laden with oil. Meanwhile, in an Elizabethan country house, SBS operative Stratton has been seconded to bodyguard work and is bored by the lack of challenge. Not for long. With the helter-skelter pace that defined Duncan Falconer's brilliant debut THE HOSTAGE, Stratton is whisked away by helicopter to assist in a daring assault and rescue. THE HIJACK ranges from London to the Gaza Strip, from Riga in Latvia to Jerusalem. With a rich cast of characters from Russian secret service operatives to Al Qaeda terrorists and Israeli Intelligence, the authentic detail and heart stopping narrative will propel Duncan Falconer to the highest class of adventure writers. "...The Hijack, apart from being an exciting read, covers the subject of remote viewing. Alternatively known as psychic spying, this technique has been tried by various governments, to see if they can use it to locate submarines, drugs caches and other items of interest." "The climax of "The Hijack" occurs when one of the good guys attacks a nuclear "suitcase bomb" with a brass crucifix and a stone, in an attempt to prevent it from exploding. (I am not making this up.) "The Hijack" is not your typical action thriller. Many of the usual ingredients are present, including an Arab terrorist attack, a nuclear device, the threat of WW III, the tough guys from the British and Russian Special Forces and the cynical manipulators in the intelligence agencies. But the characters are not stereotyped, and come across as real people. 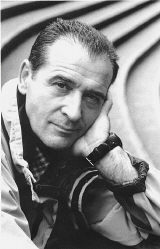 The hero, John Stratton of the British SBS, is a complex person filled with conflicting desires and doubts. There's an Arab terrorist with a very unusual background with whom we find ourselves sympathizing. Even the "bad guy" who prepares for the detonation of the nuclear device in the hopes of starting WW III is presented as a very interesting and understandable person. There are other unusual aspects to the story too, for example a clairvoyant who works for the CIA. And there are occasional bits of humor, like when one of Stratton's colleagues speculates about whether an especially long nose hair was actually an ingrown eyebrow hair. But Duncan Falconer doesn't follow the writing style of Andy McNab, former British SAS member, whose novels describe the nitty-gritty of Special Forces skills and procedures in excruciating detail. 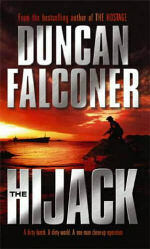 Instead, Mr. Falconer's writing style is closer to that of Frederick Forsyth, with a plot that works on several levels, from the fights between the individual good guys and bad guys to the high-level decision-making in the various intelligence agencies. There's also a touch of Matthew Reilly in Duncan Falconer's story telling, especially the description of how three SBS teams led by Stratton stage an assault on a hijacked supertanker. Here the action is definitely over the top, but quite entertaining. My only real criticism is that the whole story is rather farfetched. But this is a standard problem with action thrillers - it's very difficult to write an exciting story that passes the test of being completely believable. "The Hijack" is definitely a much better than average action thriller, and highly recommended if you're in the mood for a hard-hitting story in the style of Frederick Forsyth, with touches of Andy McNab and Matthew Reilly."